Man, I am floored about the implications of today. We’ve been waiting so long for this to happen. Finally. 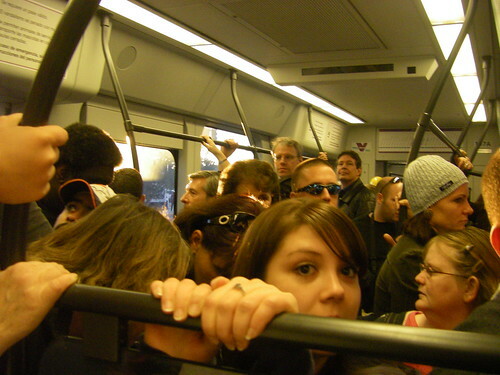 Saturday, December 27, was the first day the general public could board the light rail trains running through Phoenix! I’m just waiting for things to settle down a bit so that I can ride without too many hassles. Going to have to visit in February or so just to check in and enjoy a much-quieter situation with the transit. I couldn’t really enjoy all the festivities with all the people. We boarded at the Montebello/Christown/Spectrum stop and the wait was about 3 hours for us. The news reports of 1.5 hours seriously underestimated the wait time. 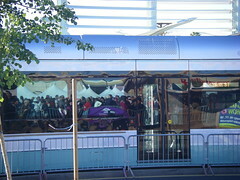 The photo shown here is a picture of the train at the station with the crowd reflected in the window. Lots of people! The ride was good and smooth and I think everyone is really jazzed. I can’t wait to see what happens. This is what it is like to drive by the light rail, as during the last trip to Phoenix we visited and ended up going alongside it during its brief appearance on Camelback Road (roughly between 19th Ave. and 7th St. if my memory serves me correctly). We were just coming back from the Tokyo Express at 12th St. and C-back. I loves me some Tokyo.